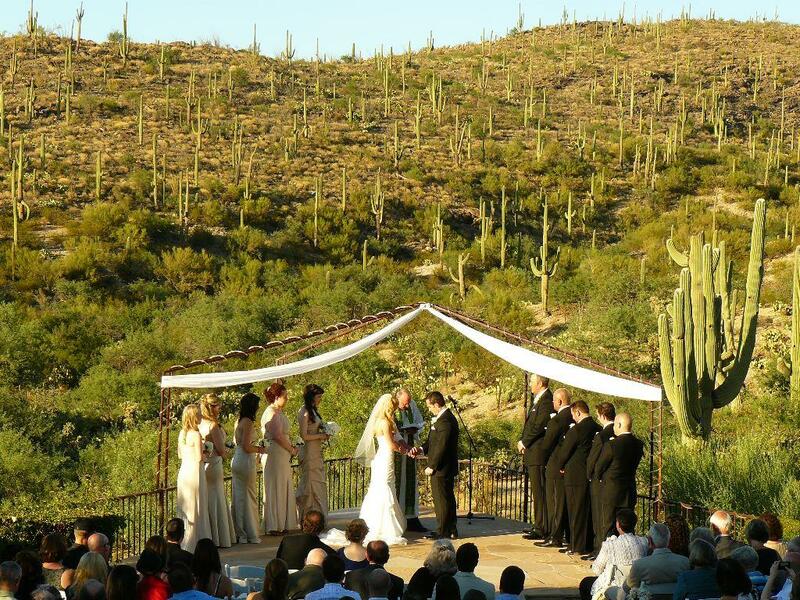 Located adjacent to the world acclaimed Saguaro National Park, Saguaro Buttes (map) is the perfect place for your wedding and reception, offering very affordable, all inclusive packages at one of the most beautiful facilities and surroundings in Tucson. We are located on the scenic route of Old Spanish Trail, nestled against the Saguaro National Monument, surrounded by hundreds of towering Saguaro cacti. Our reception area offers over 6,000 square feet of modern banquet space able to hold up to 300 guests with additional outdoor patios. With wall to wall windows, your guests will enjoy 360 degree views of the most spectacular outdoor beauty imaginable. Our cascading waterfall, abundant rose bushes, lush green grass, and rustic arch, is the perfect setting to make your dreams come true. Your guests will enjoy cuisine from a selection of one of the premiere catering services in Tucson, with twelve delicious menus to choose from plus several additional menu options to please every palate. With a professionally waited tuxedo staff, elegant dining, and candle lit room, your guests will enjoy a wonderful dining ambiance. Saguaro Buttes is by far one of the Southwests premiere wedding venues attested by hundreds of newlyweds. It’s An Awesome Southern Arizona Experience. It’s A Private Exclusive Facility. 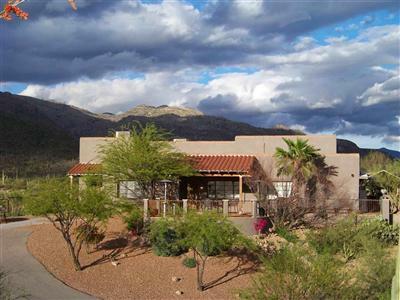 Saguaro Buttes is an exclusive and private location. 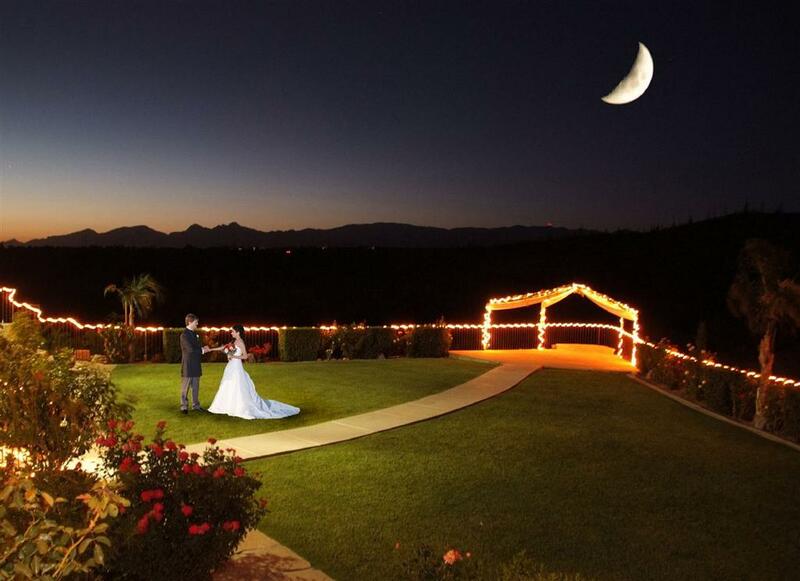 With 26 acres located adjacent to the Saguaro National Park, with miles and miles of open space surrounding Saguaro Buttes and yet still close to town, your event will enjoy total privacy without driving for hours to get there. On the day of the event, you and only you have use of the property, exclusively. There will not be any other parties, weddings or events taking place at the same time. You will not have people other than your guests on the property. “Rivers Edge Catering Company” provides some of the best cuisine to please any palette. They have several menus to choose from, with taste testings to assure you of the right menu for your guests. Their tuxedo wait staff give your event an elegance that your guests will appreciate. With your choice of buffets or an upgrade to plated meals and catered Hors D’oeuvres, you will have plenty of options. For Its Peace, Quiet and Serenity. Far from any train tracks, airports or busy streets, you will have a quiet and peaceful location for your wedding. Located on Old Spanish Trail a designated scenic route, your guests will enjoy the short scenic drive and the quiet and serenity of the Arizona Desert. There is plenty of on site paved parking, and our shuttle service so your guests will not have far to walk. They will be greeted by two parking attendants to assist and give directions. We have no horse corrals, or animal livestock close by to add any unpleasant odors, or unwanted flys, and mosquitoes. Because There is Only One Event Per Day – Yours. Your special day will be that, only yours. We only allow one wedding a day, and so your day at Saguaro Buttes is yours only. We will not book two events on the same day, i.e. (a morning and evening event), we want you to have plenty of time on your special day, so we will have also have the time to pay attention to the little details. If you need to come in early to decorate, you have that option. This is a promise we make to you and it is important to understand how this can impact your wedding, For more info about this read Your Wedding Day. For its Gorgeous Sunset Views. Arizona is known for its beautiful sunsets, and Saguaro Buttes is the place to be to take the pictures. 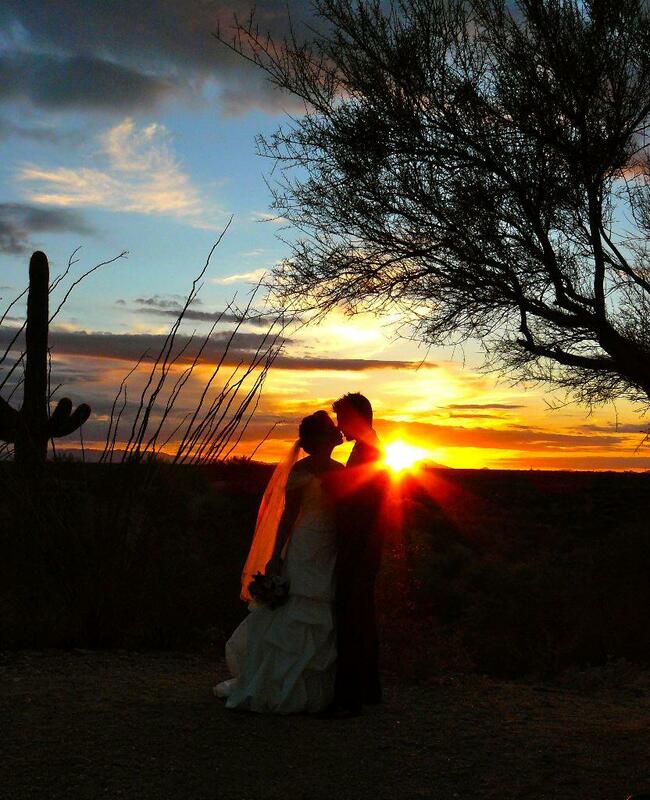 If sunset pictures are important to you, than you can not beat the views at Saguaro Buttes. 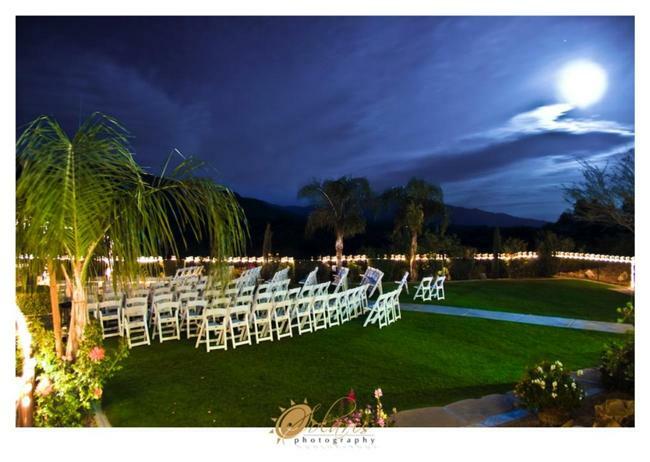 We are known for some of the most gorgeous Sunset photos with 360 degree unobstructed views you can get any angle you desire. We can not guarantee beautiful sunsets everyday, but we can guarantee if there is one, you will have the perfect place to take those special photos. We have several hilltops just perfect to give you the best angles with Saguaro Catus, Mesquite, Palo Verde and Ocotillo to frame your pictures. 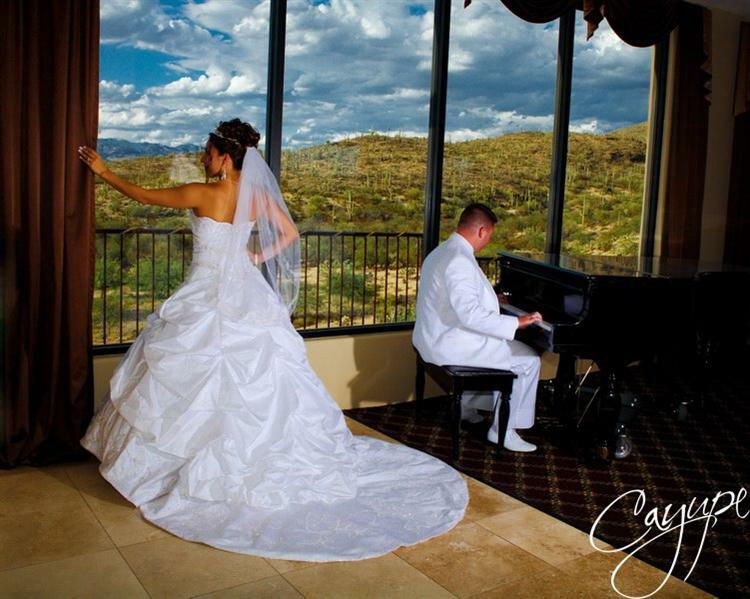 Your guests will also enjoy watching the Rincon Mountains, the Santa Rita Mountains, Tucson Mountains, and the Catalina Mountains change colors in the glow of beautiful sunset colors from our outdoor patios. For its New and Modern Facility. Built recently, Saguaro Buttes is a modern facility. With air-conditioning, higher ceilings, and wall to wall windows to take advantage of the surrounding beauty. 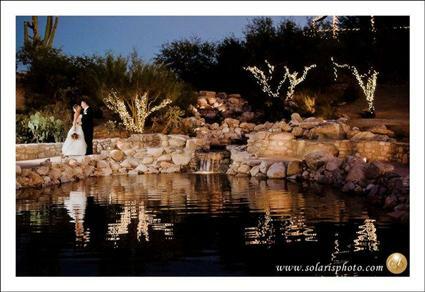 Up to date audio and visual equipment, surround sound for music lovers both inside and outside, and a tranquil waterfall in the ceremony garden. 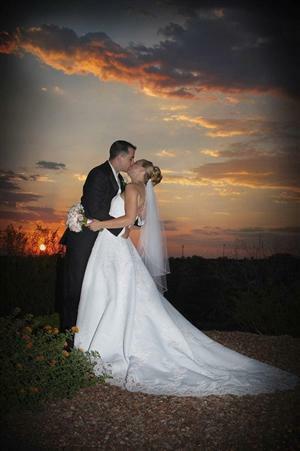 All of our wedding packages include the services of a Prosfessional Wedding Coordinator (click here) recognized and certified by the “American Acadamy of Wedding Professionals” This certification was a very extensive course with many hours of study. Your wedding is too important not to have the very best. All of our ladies have years of experience and have hundreds of weddings “under their belts”. They will make your wedding a much easier experience. Because it is a Great Value.